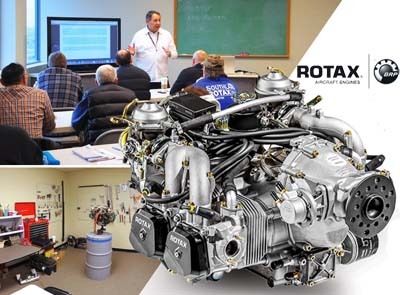 Rotax Maintenance Classes — If you are a professional or wanna-be pro in the maintenance or overhaul of Rotax engines, you must take factory-approved training. You have choices in such training by recently California Power Systems announced a series of classes. • Rotax 2-Stroke Service Course is for technicians wanting to rebuild or maintain all water-cooled and air-cooled 2-stroke Rotax aircraft engines. Learn to perform a complete engine rebuild with failure analysis and a focus on preventative maintenance. —March 6-7, 2017. • Rotax 912 / 914 Service Class is for technicians wanting to service 912-series engines or owners wanting to do their own scheduled maintenance. This course will give any FAA A&P or LSA Repairman certificate holder the credentials to perform all scheduled maintenance and level #1 troubleshooting procedures. —March 8-9, 2017. • Other classes include: a 912 / 914 Maintenance Class for technicians wanting to perform more in depth maintenance tasks. —March 10-11, 2017; 2 Stroke and 912 / 914 Renewal Course for current iRMT license holders. —March 12, 2017; and, a 912 / 914 Heavy Maintenance Class for professional mechanics. —March 13-15, 2017. All classes are held at California Power Systems’ training facility at the Chino Airport (KCNO). Visit the CPS website for all details. You can also call Bryan Toepfer at 800-247-9653 x302 or email Bryan. See California Power Systems representatives at Sebring Expo 2017.